This page contains links to my collection of Vypyr schematics, photographs, and illustrations. Please leave a comment if you find these useful. If you have any pictures if the inside chassis of any of the Vypyr amps that I don’t have here please send a copy to Vypyr Schematics. Also, any missing schematics would be greatly appreciated. I’m looking for the Sanpera I schematic in particular, but a lot of the tube Vypyr schematics are missing from this collection as well. Recently added the schematics for the VIP 2 amplifier. There are some interesting similarities and some surprising differences between the classic Vypyr and the VIP designs. It is pretty obvious that Peavey applies some good process improvement in their design group. Thanks go to WashburnTabu on the Peavy Vypyr Forum for collecting most of these. Hello, I have a Peavy Vyper 2. Its new to me, have played through it for about 2 hours, then I wanted to check out the computer adjust-ability – the reason why I wanted this amp… it said it had the wrong firmware and needed to be updated.. So I did, now I get no “light show” and from what I have seen, I need it to be reprogrammed, but the USB does not work…. is this something that you can fix?? I can send just the amp minus the cabinet and speaker. I just want to play though this amp. I have left you a message on your youtube fix and sent you an email. I have done this for people in the past. Where are you located and do you have any geeky friends with Raspberry PIs or Arduinos who could help you out? I do this on occasion. Where are you located? I came across your site looking to troubleshoot my Vyper VIP3 and Sanpera II problem. I plugged in the other day and my Sanpera II pedal was not working. There is a glow on the pedal screen but no text and none of the LEDs are lit. I brought the pedal (and cable) back to guitar center and plugged it in to another vyper and it worked fine, which leads me to believe there is a problem at the amps Midi jack. Have you come across this? Would a factory reset work? or am I likely going to have to replace a board in the amp? What kind of project would it be to replace the input? There were problems with the DIN plugs that Peavy used in the earlier Vypyrs. You might want to check to make sure that the DIN connector is getting all the way into the socket (and that the socket isn’t pushed back too far for a good connection). Hi, I stumbled across your site looking for troubleshooting guides or any other info on common issues for Vypyr VIP2 amps. I have one (technically a friend’s) that I had been using for a few months & generally liked it. It was plugged in & powered up one day & I heard a loudish *pop* & it simply died. It won’t power on at all. I have opened it up, simply because the fuse is inside the head, but the fuse appears to be fine (1.6~1.7 ohms across it but definite continuity.) I substituted a couple of other known good power cords to eliminate that as an issue. Sounds like a bad fuse to me. Did you remove it from the circuit for this measurement? Trying to test a fuse in-circuit does not work. Bigger question is why did the fuse blow? I just got a VYPYR 75 and would like to rebuild it into a bass combo using an Eminence Kappa 12A speaker. I will close the cabinet that will be vented (bass reflex). Now to things digital: the bandwidth of the equalizer (especially the bass knob) is pretty narrow and works on a different frequency that I would like. Is there a way to change these settings digitally? Or is the sound network analogly ‘hard wired’? There is always a way, unfortunately there isn’t a practical way. The equalization is performed digitally by the software. You would need to change the software to alter the EQ curves, and as far as I know the source code for the software is not available. 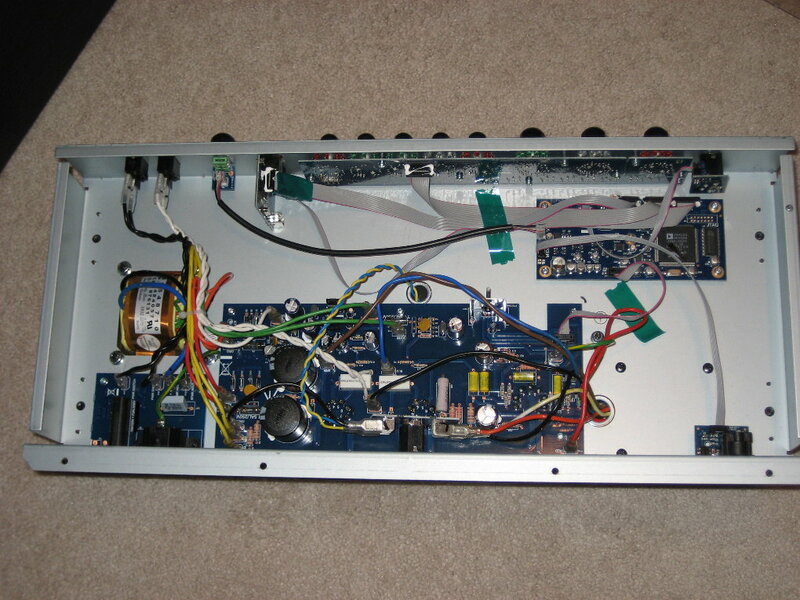 Peavey modeled the EQ for each of the amp models on the amp being modeled. You will probably find that the EQ behaves quite differently on each of the amp settings. Try them all, you may find one that works for you. I have a problem with the power sponge popping and crackling when touched. It makes those sounds and cuts the volume dramatically. What would happen if i disconnect the power sponge wire? Would it affect anything? Sound like a loose connection to me. 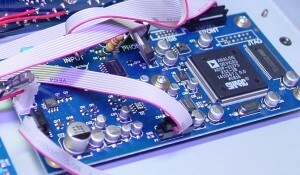 You might check the edge board connecter between the DSP board and the power sponge/Power amp first. Hi, is it possible to connect a dsp print of a vip2 directly to the powersection of a tube 60? Meaning of all connections are the same of the Vypyr 30 and vip2 dsp prints? Have Vypyr 2 Vip 2 and if you turn the unit on all the lights flashing in sequence over and over again . Unplug input board and lights work like suppose to. So i replaced input jack assy. Still same problem can you give me some suggestion on cause. I mistakenly bought a Sanpera Pro foot controller, thinking it would work with my Vypyr 212 tube combo, but alas it does not The return data from the amp appears to work, but none of the buttons do anything. Is there anything that can be done about this? Some custom firmware that can be flashed? I have a Ground Control Pro, which works great, but the two expression pedals are what attracted me to the Sanpera. I just picked up a Vypyr 75 and it is dead. I have been trying for hours to get it going. The fuse was replaced and tests good with a multimeter. When I attempt to power on the amp, there is no light show and there is only a soft pop of the speaker when powered off. I have a mac and can’t seem to find out how to download the firmware update. Please let me know how I can fix this amp. Good candidate to attempt reflashing. What part of the world are you in? Thanks much for this page! I own Vypyr T60 and I’d like to know if it is possible through sanpera’s midi make fx loop(send/return). Is it possible? Thanks for further answer. MIDI is a serial digital protocol (no audio). If you are asking about an audio send/return to send the audio through a compressor or reverb or something like that, then no. It is not possible. Hey guys, ive got a problem with my vypyr 30. Its the original one that came out. I can play it for about 30 minutes before it stops outputting sound through the speaker. When that happens i can still hear it thriugh headphones, but no sound comes from the speaker. If i turn it off and leave it for another 30 minutes or so, the speaker works fine, but eventually stoos again. Has anyone had this problem before? I really like this amp so i would like to be able to fix it and use it again. Thanks for any helo you can give. Sounds like the power amplifier is overheating (or the voltage regulator for the power board is overheating). How about modifying the Sanpera 1. Would it be possible to add two foot switches to act like your pressing the 1&2 or the 3&4 foot switches on the Sanpera simultaneously? Because if I don’t get the 3&4 simultaneously for the looper then I have to re stomp it into aux mode & try again (The Sanpera’s are not really that balanced so every time you rock forward to ingage the main or aux the pedal lifts off the floor. So, I prefer not to have keep trying just to activate the looper.). Are there any actual pictures of the boards available or just the drawings. I bought a VYPER 30, thinking that it had a USB (Because,the Peavey sticker on the Amp said the 30 Watt had ,”Studio Quality USB.”. I’m not good at schematics. So, if I could see the insides I’d have a better idea as to if I could get a USB board and just be able to plug it into the board on the Amp, cut a slot for the plug and call it good. Or, if I’ll have to do some soldering if it’s possible at all? You can kind of see the board on the 60 and 75 watt chassis pictures HERE. The board has the aux input and headphone out jacks on it as well as the USB port. If you look, you will see that it has two ribbon cables that go to the DSP board. Your Vypyr DSP board does not have the header pins on it. Adding them involves unsoldering the pin holes on the board, then soldering in a new pin header. If you aren’t familiar with using a solder sucker you are probably not up to taking on this task. With the header pins soldered into the DSP board, the next step is to buy an aux/midi board and a USB ribbon cable from Peavey. I have not priced these recently, but they used to cost around $40.00. New Peavey board in hand, the next step is to fabricate a board mount in the chassis to hold the board and to drill holes for the Aux input, headphone out, and USB B connector somewhere in the chassis (nothing says they have to be on the front). If you aren’t familiar with metalwork in small chassis boxes I can assure you that this will end up looking like crap, so seriously consider mounting this on the back of the chassis instead of the front. As I said in my other response, the end result (Peavey USB connection to computer) truly is not a valid solution to recording your riffs. The only reason to consider doing this is for the novelty, not for the music. Would it be possible to put a USB on a Vyper 30. I bought one when they first came out. When I got it at the store I took it out the box and tested it (Before I paid for it.). I thought that I had to by a USB adapter to plug into the MIDI port (Computers were just starting to take leaps. So,I inquire about it.). After, I got a computer that I thought would be able to handle the systems requirements I started to look into how to take advantage of this “Studio Quality USB”. Even though it says that it has a Studio Quality USB (I still have the sticker on the side of the amp.) I can only find out that it is only available in the higher Watage VYPER Amps. So, would I be able to put a USB port on my 30 (Like it should of already had.)? Is it possible? Yes, but the better question should be does it make sense. I’ve spent a lot of time and effort messing with recording using the Peavey USB port and can tell you from personal experience that the Vypyr USB implementation is not adequate for recording. It is limited, tends to be noisy, Is difficult to match signal levels with computer inputs and the list goes on. Assuming that you are looking for a USB connection to record direct from your amplifier, just say no. Reasonable audio interfaces are readily available that do a much better job at very reasonable cost that really work for recording (zero latency monitoring, proper impedance matching, headphone and line/computer outputs, etc.). Buy something like a Scarlett 2X2 audio interface and connect your Vypyr to it using the headphone out on the Vypyr to the Interface. Just recording your guitar riffs isn’t something that you can do much with. Once you’ve done it you will wonder why. Find a good DAW (Digital Audio Workstation) program for your computer and start doing your own multi-track recording. Lay down the rhythm for a song then play your leads to complete the song. You might even consider getting a good microphone to plug into the interface and do some vocals. Yeah, it is possible to solder in the USB jumpers in a Vypyr 30, change the model dip switch settings on the encoder board and buy/install a USB board from Peavey, and connect your Vypyr to your computer. My advice is that it isn’t worth the effort. Lots of good DAWs out there. If you have a Mac you already have one installed (Garage Band). I recommend Cakewalk products with Home Studio being a great starting point (about $60.00) or Reaper can be run in demo mode forever. Glen, You did a great job, I wanted to know if there is a way to add effects loop in this amp just after the AMP channel….so that we can put in Noise gate(that is just after the Amp’s drive), EQs, different analog effects…..followed by the amp’s inbuilt reverb and delay and then the output. There is an effects loop mod that you should be able to find in the Peavey forum. This sits between the final DSP altered output and the power amplifier. Not quite what you are asking about, but it is about as close as you can get with DSP modeling I’m afraid. I don’t know if this will help you or not but I’m looking at the main board from a silver Sanpera 1 and it has the same part number as the Sanpera 2 in your schematic. If it would be of any help I’ll compare and let you know what parts are not loaded on the 1. The reason I came across your site is that this Sanpera 1 (again an older silver one) does not light up with my daughters brand new VIP 3. Do you know if the older Sanperas are compatible with the new VIP’s. 3) plugged in one pin sideways. Also, if you are not using a Peavey supplied cable you may want to check that all eight pins (and the shield) are connected through. Some eight pin cables are only wired for seven pins. Do you know which screws take the 75w chassis out? Would be much help if you coukd clarify here thank you! There are four screws on the top of the amplifier. These are on the metal strips. These are long screws and must be completely removed to take the chassis out. No need to unscrew the handle. Then, on the back of the amplifier there are two screws holding the back of the chassis up. One time im turn on my vypyr 30 but… Sanpera doesn`t work. It`s realy dead all is turned off (leds, pedal doesn`t work). I`ve tried to check cable but aslo with connection with midi slot signal passed but all is dead. Where is the problem? This seems to be an all too common problem. The headphone jack ‘switch’ is way under engineered and breaks with the slightest abuse. It is fairly easily replaced (and inexpensive from Peavey parts). A better solution would be to wire in a proper 1/4″ switched jack on the back of the chassis. One time im turn on my vypyr 30 but,, Sanpera doesnt work. Is realy dead all is tufned off (leds, pedal doesn`t work). I`ve tried to check cable but aso wit connection with midi slot signal going but all is dead. Where is the broblem? The USB board is pretty inexpensivw and real easy ro replace. I assume you mean the MIDI board. I will call them for pricing and info, thanks! would it be an easy fix? if so would it also be an easy part to purchase on a local hardware/electrical store? or does it has to be through peavey? Do you have a photo of the 30 Watt Vypyr? I have been looking through these schematics and I am curious is there a diagram from the foot switch board P1 to the 8 pin midi plug. Not sure specifically what you are looking for, but there are four of them on the main borad in the Sanpera II schematic. P1 doesn’t go to the MIDI port. It goes to the Sanpera board which then connects to the MIDI port. What I am trying to find out is if it possible to run a basic foot switch through the midi port or does it have to be the Sanpera. I saw a video where a guy build a home made foot switch that he ended up having to solder to the back of board where the controls are located. It worked great but would rather see if it would possible to go through the midi connector like the Sanpera. I was referring to p1 in the Sanpera I switch/led schematic. Where does that go. Larry – The MIDI port is a MIDI port – not just a switched line. If you want to switch your Vypyr you need to use the MIDI protocol. There are a couple of other MIDI options other than the Sanpera, but there is no way to use a simple foot switch for this. P1 goes to an 74HC165 on the mother board that is read by an CY8C27443 which converts the action to MIDI CC commands and sends them to the Vypyr using the MIDI serial protocol. Thanks Glen, I figured that I havent studied or used the midi protocol to understand it so my best method would just buy one. Glen.. While looking through your pages I came across the ‘Pimp Your Vypyr’ link. This looked pretty interesting since I own a Vypyr 15. Unfortunately, the page it takes me to, drieg.com, is flagged as harmful by my Firefox browser. Could you verify that this is a non-harmful page? Or perhaps notify the page owner of the problem? Also, I’m going to be taking a closer look at your Virtual Vypyr program later today (gotta take my grandson fishing this morning). I’m a retired programmer with 31 years of computer graphics experience. Maybe I can put my experience to good use. Thanks for the heads up. I checked the site and also found that it appears to have been hacked. I have removed the links from this site and posted what I hope are appropriate warnings. Petr is a straight up guy so I’m sure that wasn’t anything that he did intentionally.